One of the things I have always liked about Lightroom is it’s simplicity. With just a few tips, most people can be up & running organizing and developing photos in no time. Another thing I enjoy about Lightroom is finding uses for the adjustment tools that are not necessarily obvious at first glance. Here are a couple of tips for adjusting color selectively in the Develop module that may help you think differently. 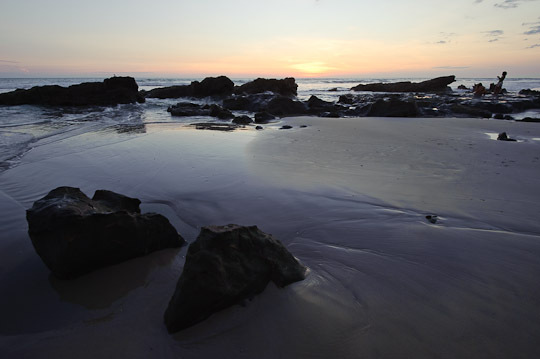 I’ll start with this image that I made during my recent workshop in Mal Pais, Costa Rica. This is the exposure out of the camera with the “Vivid” profile applied in LR’s Camera Calibration panel (see my article HERE for details). It is a pretty good exposure. The highlights and shadows are not clipped, but it’s a little flat. The first thing I want to do is bring out some detail in the rocks in the foreground. In the Develop module I press the ‘K’ key to activate the targeted adjustment brush. In this case I crank up the Brightness slider so I can see where I’m painting, set the Flow to 80, Density to 100 and turn Auto Mask on. 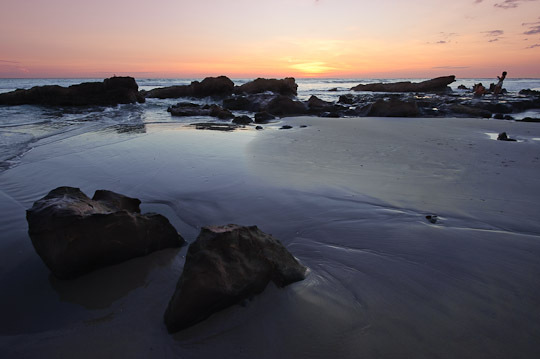 I paint over the areas on the rocks where the light from the setting sun is hitting them to lighten those areas. I don’t want to add too much light to the shadow side of the rocks so that the lighting looks natural. When I’m done painting, I adjust the Brightness slider until I get the subtle brightness I am looking for. Now for a color trick… Making sure that the brush I have been using to paint the rocks is active, I click the Color box in the Adjustment Brush panel. I click and hold in the color-picker, then drag the eyedropper over my image to the warm colors of the sunset until I find a color I like. Once I pick a color I can adjust the saturation in the color picker until it is just right. Now the rocks are a bit brighter to show some detail, and they have a hint of warmth to help them pop against the cool colors of the waves and sand. The last thing I want to do is to add some drama to the sky. The colors of the sunset are a bit washed out because of the exposure I needed to keep detail in the rocks. For this adjustment I press the ‘M’ key (in the Develop module) to activate the Graduated Filter. I click the Color box and choose a warm color from the sunset like I did before. For this image I don’t want a soft graduation, so I click on the horizon and drag down just enough to apply the filter. This way I can apply the effect to the sky without affecting the ocean or the rocks. You can adjust the color in the sky by adjusting the saturation slider in the color picker, or by using the eyedropper to sample different colors from your image. The filter will update as you move the eyedropper around the image, which makes it easy to pick just the right color. In this case I lowered the Brightness slider a bit after I decided on a color to saturate the sky a bit further. 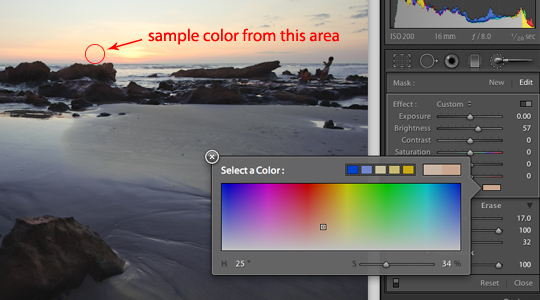 The color adjustments in Lightroom make it easy to get exactly the color you want. The great thing is that it’s completely non-destructive and easy to edit or adjust later. All without ever making a mask or even opening Photoshop. I was wondering if you guys would give some Aperture tricks as well. Aperture 3 is such an amazing program in my opinion, so it would be nice to learn some tips for Aperture on DP Experience as well. I love that place!! did you get any of this tree by the hammocks in front of Tropico Latino? Nice shot! I think I missed that tree this time, but I’ll be back in Santa Teresa next spring… you should join us!